This interdisciplinary volume of essays brings together a team of leading early modern historians and literary scholars in order to examine the changing conceptions, character, and condemnation of ‘heresy’ in sixteenth- and seventeenth-century England. 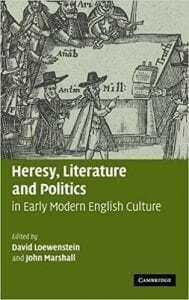 Definitions of ‘heresy’ and ‘heretics’ were the subject of heated controversies in England from the English Reformation to the end of the seventeenth century. These essays illuminate the significant literary issues involved in both defending and demonising heretical beliefs, including the contested hermeneutic strategies applied to the interpretation of the Bible, and they examine how debates over heresy stimulated the increasing articulation of arguments for religious toleration in England. Offering fresh perspectives on John Milton, Thomas Hobbes, John Locke and others, this volume should be of interest to all literary, religious and political historians working on early modern English culture.